The Center for Biomolecular Structure and Dynamics (CBSD) Center of Biomedical Research Excellence (CoBRE) expects to support two or more Pilot Projects at $25,000 in direct costs for one year during the funding period August 1, 2019 – July 31, 2020. 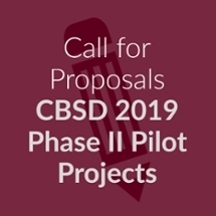 Applications must describe a pilot-type research project that fits well with the scientific theme of the CBSD and will provide preliminary data for a substantial extramural research project grant application. Preference will be given to projects that will make good use of one or more CBSD CoBRE Core Facilities at the University of Montana. This competition is open to all full-time research, tenure-track or tenured faculty at the University of Montana, with some restrictions. For more information regarding this award, and to obtain instructions for submitting a Letter of Intent, contact Sara Jestrab, CBSD Program Coordinator (sara.jestrab@mso.umt.edu).